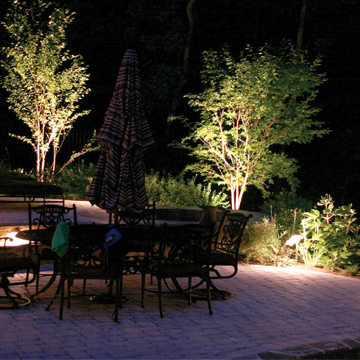 Outdoor lighting solutions have come a long way since the old days. From solar-powered lighting solutions to energy-efficient LED lighting solutions, there are now more ways than ever to aproach any outdoor lighting need. Outdoor lights are meant to serve both an asthetic and functional purpose. Any proper lighting solution will take these both into account, illuminating outdoor living areas to provide safety and visibility while beautifying the outdoor space in a way that makes a big visual impact. It's important that your outdoor lighting captures and accents the beauty of your home. It's at least equally important that your outdoor lighting maximizes the enjoyability you're able to receive from your outdoor space. That's why you should approach an outdoor lighting expert that's able to understand the importance of both. At Spectrum Electric, we have both a keen eye for asthetic design and an expert understanding of the science behind outdoor lighting. This sets us apart from many other providers in that we're able to not only provide you with a solution that's reliable and cost-effective, but one that's remarkably beautiful as well. is lighting that is designed and placed to highlight the architecture of your home, including arches, entryways, gables, steps, brickwork and any other architectural features of your home. It increases your property's value through basic "curb appeal", while creating lighting affects that will feature and accentuate the beauty of your home. is a great way to showcase the beauty of your home landscaping, including gardens, flower beds, rock formations, ponds, retaining walls and any other outdoor features you want to bring to life. Lanscape lighting is an easy, cost-effective way to bring out the beauty of your foliage, while adding a remarkable nighttime visual impact to otherwise dark areas. goes a long way toward increasing the safety and security of your home, while providing a welcoming environment for your guests. When properly utilized, pathway and driveway lighting serves a necessary, important purpose while adding to the overall beauty of your home. At Spectrum Electric, our services don't stop at new installations. If you have a lighting solution in place that is in need of repair or you'd like to add to your current outdoor lights, we're happy to help. We've been installing and maintaining Central Florida lighting solutions for years, and our level of expertise, dedication to quality, and competitive pricing ensure we'll always deliver exceptional quality at a great price.